PixelCNC: The best image-to-Gcode CAM software around! Hi Dean, when you change PixelCNC over to metric it changes how the workspace and grid are scaled in the render. Tool sizes are relative to the project, so if you’re in metric then a 10mm tool diameter will be 1/10th the size of a 100mm project. Feed rates only determine what number is output in the G-code and doesn’t affect anything visually - but in the feeds it will still say ‘IPM’, that will be fixed in the next version that should be out this weekend. Setting PixelCNC to inches/metric doesn’t take affect until a new project is created via File->New. The only situation with creating a metric project is that you’ll have to re-enter all the parameters from scratch because they’ll still have the stored imperial defaults/previously used values. There are a few values that are stored independently per imperial/metric, such as the project dimensions. Once you set it up with metric feeds and stepsizes and such it will remember those for next time you create an operation. Converting between metric/imperial could have an automated element to it, but it will only be able to do so much. For instance, the previously used tool dimensions aren’t something that can be mapped one-to-one because a 0.25" tool doesn’t have an exact counterpart in metric (i.e. 6.35mm tool? that would just be called a 1/4" end mill ). Perhaps what I should do is allow intermixing of metric/imperial project dimensions, operation parameters, and tools, instead of requiring that everything be either one or the other. That way you could use an imperial tool in a metric project and vice-versa. I’ll have to mull over that a bit before I decide what to do exactly. Let me know if you have any further questions/comments/concerns and I’ll do what I can to work things out and get PixelCNC to where you need it to be. Bit question. Like you said, bit are specific to the project. Is there a way to create a bit library rather than doing it every time? Are there also plans to expand the types of bit one can use? Right now you can create about 4 different bits using the two bit types. If you want a ball nose end mill you create a cylindrical bit that has a corner radius equal to the the radius of the flutes (i.e. half the flute diameter). If you want a flat end mill you use a corner radius of zero. If you want a v-bit you enter a taper angle and a tip diameter of zero. If you want a tapered cutter with a flat tip you enter a nonzero tip diameter. The only type of tool that won’t be supported are any that undercut, simply because that would require that the heightmap based algorithms be redone entirely to utilize a voxel-based approach. Which is possible but outside the scope of PixelCNC, and would likely be done as a whole separate program altogether. Are there any other tool types you want? Also, yes, I can add in the ability for it to remember all of your tools instead of blanking the list every time. Then you could build up your tool list and just choose from it when creating operations. Is that something you’d be interested in? EDIT: Or would you rather choose from a separate library to build your list for each project? I am thinking of something like what V-Carve has. You add the tool and then you can choose it for each action. One more thing, the UserGuide.html in the PixelCNC folder has a lot of information about all of the parameters for everything. 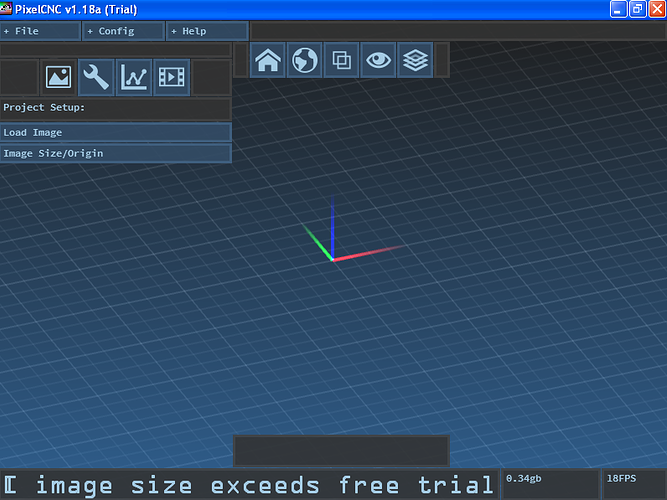 It is full of tips and useful bits of information for using PixelCNC. There’s some diagrams explaining the tool definition parameters in there too. You should be able to define just about any non-undercutting tool using the cylindrical/tapered cutter types. Hiya Clyde, v1.18a is up now. I’ve added code to specifically look for the ARB-postfixed function names when the current version of OpenGL is pre-2.1. Again, no guarantees this will solve the problem entirely, but it’s likely to work now - provided there isn’t some other problem that will get in the way, like the CPU only having 1 core. Hi Dean, did you see my reply about using PixelCNC in metric mode? 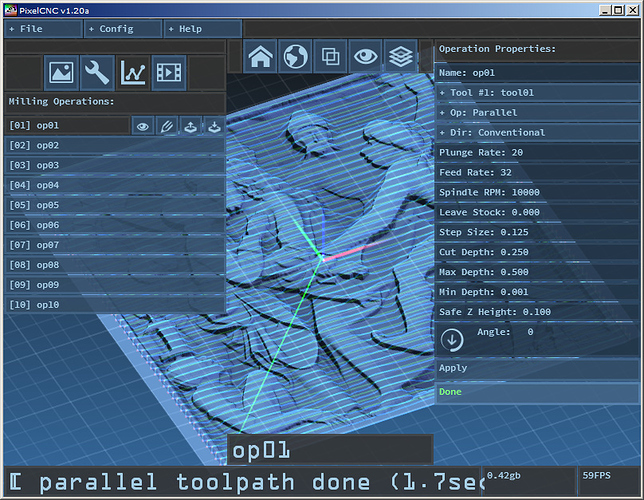 v1.18a is up now which features some optimizations and improved toolpath generation for outline/profile operations and the zero-distance cut contours of a horizontal operation. Let me know if you have any more questions or need any help with PixelCNC. Sorry I have been out of touch for a few day. I did see your reply. Thank you. I will down load v1.18a and give it a try. Thank you again for your follow up. I have not taken a deep dive into the manual, but there 3 thing I would like to see if it is not already in the program. When I import the image, regardless if there is a transparent area, it makes the carving the dimension of the file. It would be great if there was a way to disregard areas. Exporting the file as a 3d file would be very helpful in order to be able to open it in something like V-Carve in order to add it to a larger project. The one thing I really wish it had was a way to cut out the image. I am making squadron patches and there is no real way for me to make it cut out, that I have found, the outline of the patch once it is done. Just suggestions, but the program works awesome. And from what I have seen the spiral function is the cleanest. It does an amazing job. And the best function, in my opinion, is the multiple ways to have it carve. Looking forward to what comes next. This is a permanent part of my toolbox and I recommend it. recommended it to someone today. Sorry for not getting back to you until now.Good news! the program works on my desk top machine which is the unit that runs my X-Carve. For some reason it still won’t work on my lap top but that’s ok since I don’t use it to run my machine anyway. Thank you for taking the extra effort to make it work right.It’s now on my “next things to purchase” list, if not this month than next month. Howdy- I’ve just have gotten the time to start working with the software and when I try to load the samples i get a “image exceeds free trial” message at the bottom of the screen. My screen size is 640 x 480 and I’m using windows xp. thank you. EDIT: The free trial is limited to ~65,000 pixels on the image input, which means about a 256x256 (or any dimensions which multiply to 65k or less) will work on there. It was the trial version, I downloaded the version you listed and got the same message. When I shut down the program I got the following message: .Thank you. There is no installation as of now, you just unzip the PixelCNC zip file into a folder and the PixelCNC.exe file in there is the actual program you run to use it. This is only because PixelCNC is still in alpha stage of development and it wouldn’t be convenient for users to have to do a full installation process for incremental updates (which are-a-plenty during alpha stage). A one-time installation will be used once PixelCNC enters beta, and updates will be automatically downloaded by PixelCNC. In the meantime the focus of the alpha is on adding features and functionality. That being said, I’m in the middle of working on the next big release for which I’ve devised some changes to have a more robust rendering pipeline for dealing with older hardware. 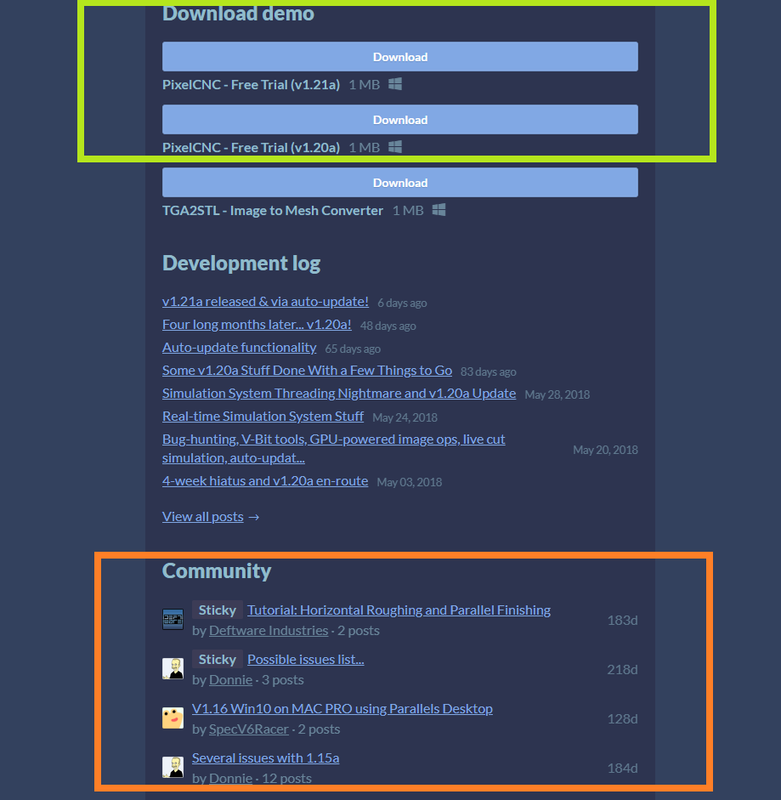 These days most developers wouldn’t even bother supporting hardware more than 10 years old, because it’s such a huge headache of labyrinthian compatibility issues, but in PixelCNC’s case I know from first-hand experience that a lot of the target user audience is running on older hardware that is otherwise perfectly capable given some coaxing. At any rate, your laptop’s GPU is limited to OpenGL 2.1, which is sufficient for what PixelCNC needs to do (huge vertex buffers), but drivers from the 2.0/2.1 era are very iffy with how they implement the functionality they claim to support, because there had yet to be a solid naming convention for everything, so finding certain functionality in the drivers can vary. As such I have been working on some changes to how PixelCNC interfaces with OpenGL to make it more robust. I’d already started on that work a few versions ago and it has resolved compatibility issues for most users with older hardware but obviously there’s still drivers out there that want things to be a very specific way in order for them to cooperate. The big update I’ve been working on now adds quite a bit of functionality and so the newer robust OpenGL interface stuff won’t be released until everything else on the agenda is ready. At the rate things are being ticked off the todo list a conservative ETA for the update is about three weeks, so I’d suggest checking back around then. I’ll be sure to visit this thread to give everyone a heads up. Thanks again. I’m not thinking that machine is going to be very cooperative no matter what. Just the limited screen resolution alone is going to cause you grief, let alone the fact that with an empty project you’re only running at 18 frames-per-second, which is a good hint that once an actual mesh is on the screen you’re likely going to be experiencing something more akin to a slideshow. If you’re actually loading the 256x256 images provided, and it’s responding as though they’re too large, I’m not sure that’s a problem I can solve, or that I should solve, simply because the machine is clearly not up to snuff all-around. You can see how crammed it all is, which maybe I can adjust a few a few things to make some more room, but even that aside if you’re running at 18 frames-per-second with an empty view then throwing half a million triangles on the screen is going to be hell on your CPU/GPU and your experience altogether. I know I can sit and track down every little thing and somehow make it all work (aside from the poor performance, PixelCNC is already extremely optimized on the mesh-rendering side) but that’s at the cost of time/energy adding actual functionality and capability to PixelCNC that makes it more usefu to both existing and potential customers. At the outset I had originally decided to not support hardware more than a decade old, but I’ve opted to at least meet some older hardware halfway because that was only a few hours’ of work to make that happen. After that it really becomes a diminishing-returns sort of thing. I’m still adding a little more to the renderer pipeline to make it more robustly handle the strange landscape of OpenGL implementations that existed back in the 2.0/2.1 era, and that’s the very last that I’m willing to do on that front, because there’s still a lot of other work to do before PixelCNC is where I aim for it to be. Thanks for working with me to try and get it going, but this is where I have to call it quits. I am still interested in determining why it’s not able to access the user documents folder for being able to write a configuration file, that is important, and another one of those things where different Windows versions demands that the program do different things, but if an XP machine is capable hardware-wise then I want users to be able to use PixelCNC as designed. Thanks again for your efforts. I’ve been looking into purchasing another used computer to run windows 7 on since there are so many great design programs that would be invaluable for cnc. I’m must confess that I am not that great when it comes to computer hardware so if you could give me a some guidelines on what I need to look for when purchasing a computer to run your (and other) programs I would greatly appreciate it.Again, thank you for your help. Hey there, hope this is the right forum for support on PixelCNC. I’ve just purchased (couldn’t find a trial anywhere to download) but unfortunately the software does not open. I first get a message saying “Search for App in App store? You need to install an app for this task”. Whether I click Yes or No (Yes doesn’t take me to an App store or anything) I get the Early-Access Disclaimer. Clicking “Yes” here begins to load the software but an error pops up - “sys_glfunc: function not supported: glActiveTexture”. Clicking OK the software seems to continue to load but then just disappears completely. This happens whether I try to launch v1.20 or v1.21. Where can I look for assistance trying to get this software to run for me? 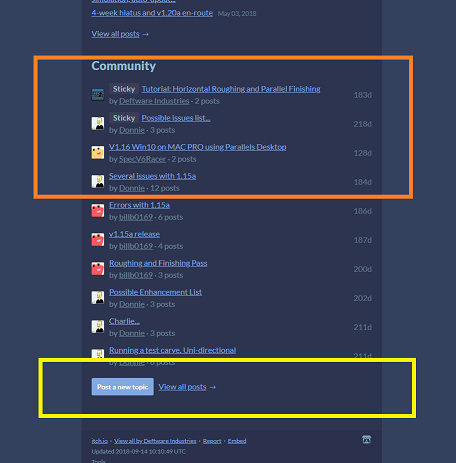 Hi KellyD, this is not the PixelCNC forum, this is just a topic/thread about PixelCNC on the Inventables forum. 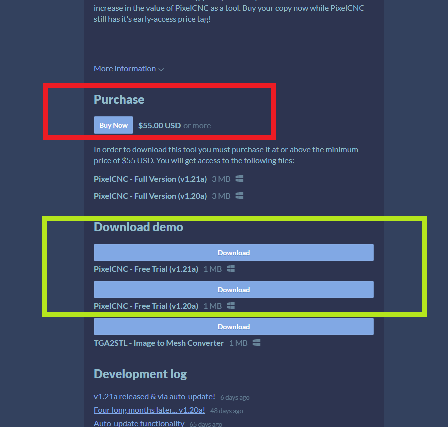 The PixelCNC forum is at the bottom of the same page that PixelCNC can be bought from, which is the same page that the free trial demo version can be downloaded from. 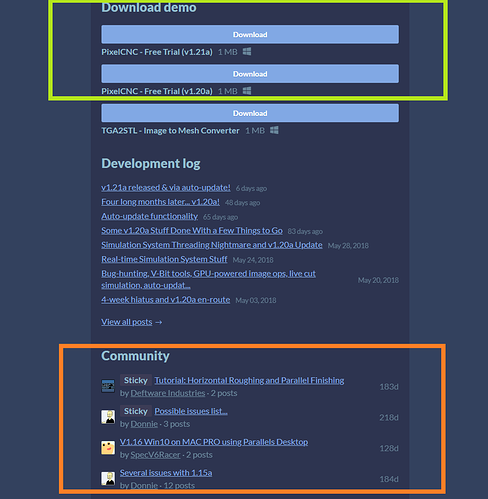 Just below the free demo downloads is the section for the PixelCNC community/forum. At the bottom of that is a button for posting to the PixelCNC forum. If you have any questions/comments/concerns about PixelCNC, please post them there.